The passionate programming is about how to keep self improving. This includes writing blogs trying new languages and other great tips. It will also give you a new perspective on your career and where you should be going. This entry was posted on April 17, 2014 by wallerjake. 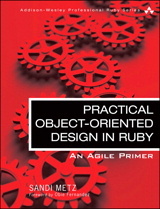 Practical Object-Oriented Design in Ruby is about how to make your code truly flexible and extensible. The book covers everything from creating a class to writing tests for that class.